At first I was thinking, is +1 Memory worth the lack of discount that Kate has? But then I noticed she is minimum deck 40, which could have a big impact on deckbuilding. The lower max deck limit is nice, but I have a horrible time keeping my deck to the minimum size in almost every game I play. I'm thinking I'll have a rough time using her as well. Yeah I see this card as being huge for an efficiency build. You don't need your console out to have the extra MU so you could have Magnum Opus (Core) and 3 icebreakers out likity split. You chances of getting any card that you have 3 of in your deck go from 6.6% to 7.5% - that may not seem like a huge deal, but an entire percent is the difference between getting the cards you want and just random cards. @Darksbane: I usually suffer from the same problem, since I like to have options. This'll definitely be a departure from my style, but I want to try it out. I'm still not sure that Magnum Opus (Core) Is worth it's install cost, but that's another argument for another comments thread. EmeraldGuardian don't forget Rabbit Hole, Special Delivery and Test Run too... A deck could go down to 32 "real" cards. At that point you are too tight to run enough long term money generation without Magnum Opus. I'd probably run The Toolbox, Modded, Personal touch, Diesel and various 1/2x copies of different icebreakers, including those that we yet have to see... And an Ice Carver of course. The deck just made itself! I am very excited about her and would love to discuss her possibilities with others. Had a pretty big debate about her on our groups facebook page so far. I printed off a copy of her so I can start practicing builds with her but Test Run will really change up Shaper. No more need for Special Delivery at all. Fun with probabilities! I'm reasonably certain I got these numbers right, feel free to check me. If there's a card you want in your opening hand badly enough to take a mulligan if it's not there (Magnum Opus is my favorite) one assumes that you're running three of them. Including the mulligan, with 45 cards in your deck, you have a 60.747% chance to draw it. With 40 cards, that goes up to 67.51%. I'm getting 51.52% which improves to 56.1%. 1-((42!40!)/(45!37! ))^2 vs. 1−((37!×35!)÷(40!×32!))^2. Test run is a bit more expensive than Special Delivery but the free turn you get with it is pretty sweet. At the same time, it'll set up console + Morning Star + A Personal Touch that much faster... She's going to be a Tinkering tank after about 15 credits of income. We don't know the cost of Test Run yet. I'm hoping there's a Dinosaurus hardware card. I like the fact that this card reduces the requiered minimum, but I might never play it cause I always have trouble to cut down to the minimum decksize. I really have a hard time seeing a situation where CT is a better option than Kate for competitive play. That $1 discount really seems a lot better than a slightly smaller deck and +1MU in almost every situation. The only situations I can see her being better in are if you really need exactly 5MU and don't want to have to put in Akamatsu's with Kate, or if you are trying to get a lot of free installs (personal workshop) and won't use Kate's discount very much. 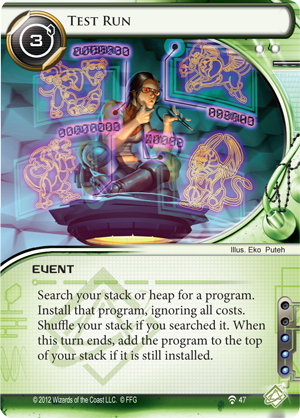 I really don't see these decks as being as good as Kate decks, though.